U.S. Air Force Staff Sgt. 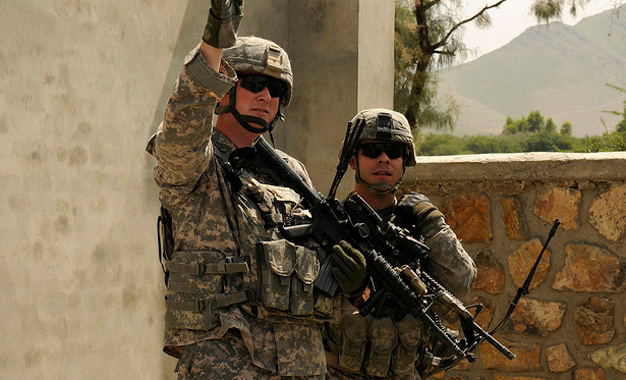 John Kingsley (left), a radio transmission operator with the Nangarhar Provincial Reconstruction Team, and U.S. Army 1st Lt. John Cerra, a security forces platoon leader with the team, look toward the location of suspected fire near Jalalabad, Afghanistan, on Sept. 8, 2010. Members of the team were inspecting a reconstruction team funded project when the attack occurred. DoD photo by Tech. Sgt. John Barton, U.S. Air Force. Photo via U.S. Army.